Yayla Bistro is a new (2014) arrival to the East Falls Church neighborhood in the western corner of Arlington County, Virginia, but this family-run establishment has the polished and professional flavor, presentation, and service of a far more established, “celebrity chef” run restaurant. Yet it has the character and personal treatment of your favorite neighborhood cafe. I am fortunate enough to have learned about Yayla even before it opened its doors. I visited its first week of operation and many times since. From Day One, its mezzes, salads, entrees, and dessert were near-perfectly executed, and it has only improved since its opening. I have proudly shared this secret with friends and family. I’ve enjoyed delicious take-out, but the restaurant itself – particularly its casual outdoor seating – is an experience worth dining in. A friend called it the best Mediterranean meal she had in five years in the DC area, overtaking more well-known and delicious restaurants like Zaytinya, Cava Mezze, and Kapnos. For a small, family owned and operated cafe, that is quite the endorsement! I’ll share a few of my favorite menu items. Full disclosure: I love Turkish and Eastern Mediterranean/Levantine food. I am easy to please, but I’ve had so many great experiences that I would share if something wasn’t worth trying. For me to go to a restaurant repeatedly, try many different items, and love nearly all of them (or at least like what I didn’t love outright) is a bold statement. Ordering the trio is perfect for sampling – or simply a first visit to determine your favorites. Portions of each dip/spread are small, so if you have an addiction to any single type, keep that in mind. Htipiti is a standout on the menu. This spread features the perfectly tangy, salty, and smoky sweet blend of feta, roasted red peppers, and herbs. Baba Ghanouj and hummus are purists’ versions, both smooth and creamy. Neither is exemplary, but both are solid and reliable. (My favorite hummus and baba ghanouj in the DC area came from a restaurant no longer in business, sadly). Please do not mistake this assessment as one of mediocrity. It is very hard to screw up hummus (much easier with baba ghanouj), but as I enjoy my own homemade versions, I’m going to be picky about it. If you try Yayla, do not let me discourage you! Both are wonderful. Patlican Kozleme is another sweet, smoky, dairy-free cold Mezze that combines roasted red peppers and eggplant. It is a nice alternative to baba ghanouj. 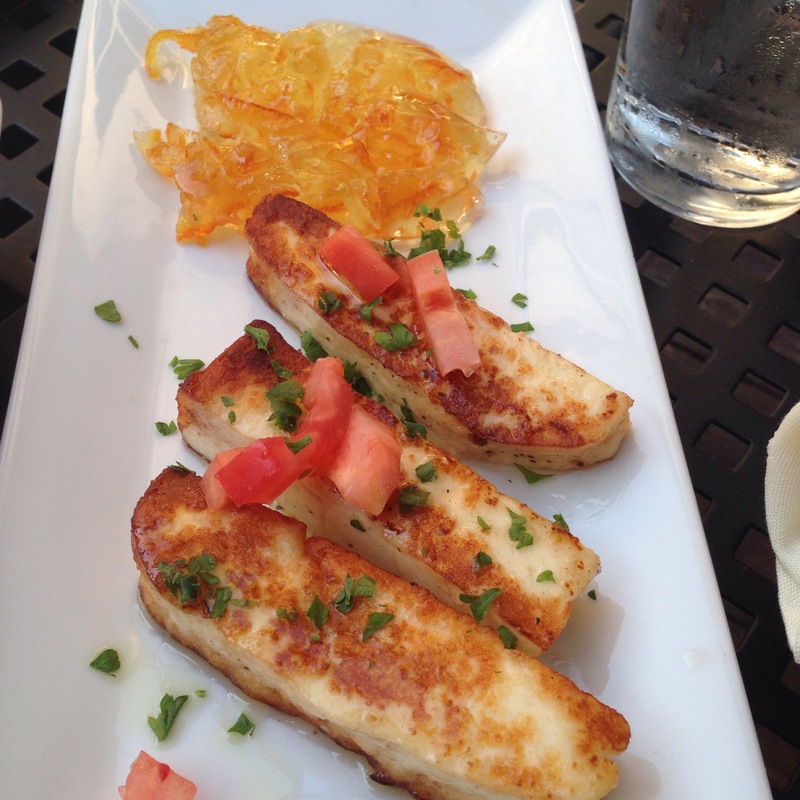 Haloumi: If you have never before tried grilled Halloumi cheese, Yayla is the ideal place for a first experience. The warm saltiness of Feta’s firmer cousin is accompanied by orange marmalade, which suits it more for sweet finish to a meal. But it is fantastic anytime. The falafel salad is a good portion and a way to feel a bit less guilty about eating falafel. Falafel is also another dish that is difficult to make terrible, and Yayla’s falafel does not disappoint. The beet salad is light, and fresh with citrus and a light vinaigrette, perfect after a heavy dose of the Mezze platter. Lahmacun pide (in the featured image, top) is something one must try. Its four large wedges are perfect for sharing. It is unexpectedly thinner than a traditional pide or even Greek pita – more akin to the thinnest Neapolitan pizza crust. Topped with ground beef and lamb accented with red pepper and spices, its flavors are hard to distinguish individually. I would say that’s the mark of a truly great dish: you could never imagine the combination of ingredients any other way. 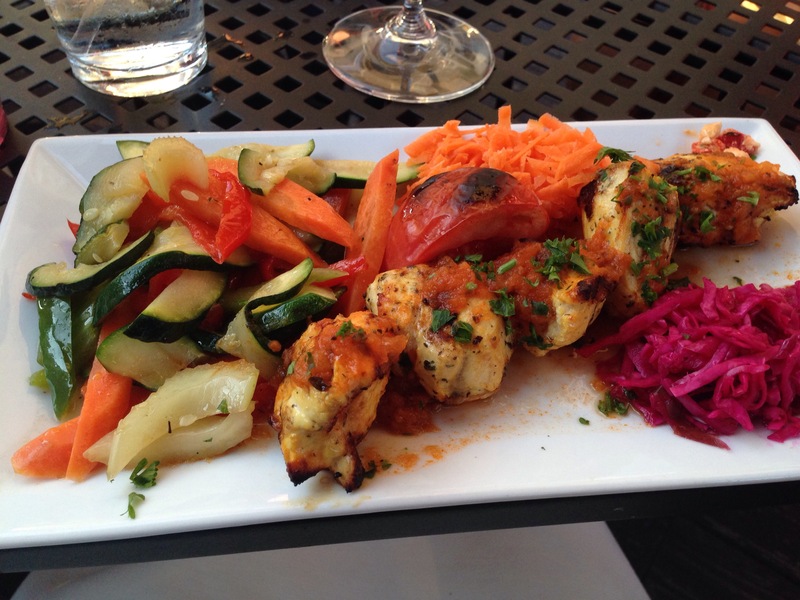 Chicken shish and other meat and fish entrees are all elegant and not at all greasy. They are lighter options for those looking for more protein or to avoid carbs. Each are perfectly cooked and seasoned. Mucver is also an excellent choice and happens to be one of my favorite menu items. The almost weightlessly fluffy, breaded zucchini and cheese patties are served with thick, creamy cacik and diced tomatoes. Despite the breeding, they feel very light and perhaps are better suited for a shared appetizer or alongside a salad for a satisfying meal. Yayla’s take on Moussaka is another often heavy, hearty comfort food that feels somehow lighter and more elegant at Yayla. It is another solid bet. With such great Mezze and mains, I’ve rarely had room for dessert. But that shouldn’t stop you from trying their baklava, sultac, or mascarpone-stuffed apricots. Rice pudding, or sultac, is one of my favorites, with its comforting Mediterranean accent of pistachios. Whatever you choose and in which combination, bring plenty of friends willing to share in the great neighborhood experience that is Yayla Bistro.